Mexico’s Copper Canyon - Over the Hill Outfitters, Inc. Riding out of Guapalayna After a Cold Beverage. Have you ever wanted to go back in time? Have you ever wanted to visit the Old West and see what it was really like, say one hundred to one hundred and fifty years ago? A place where corn is still ground on manos and metates which are only found in archaeological sites in the States. Well, it’s still possible, even without a time machine. 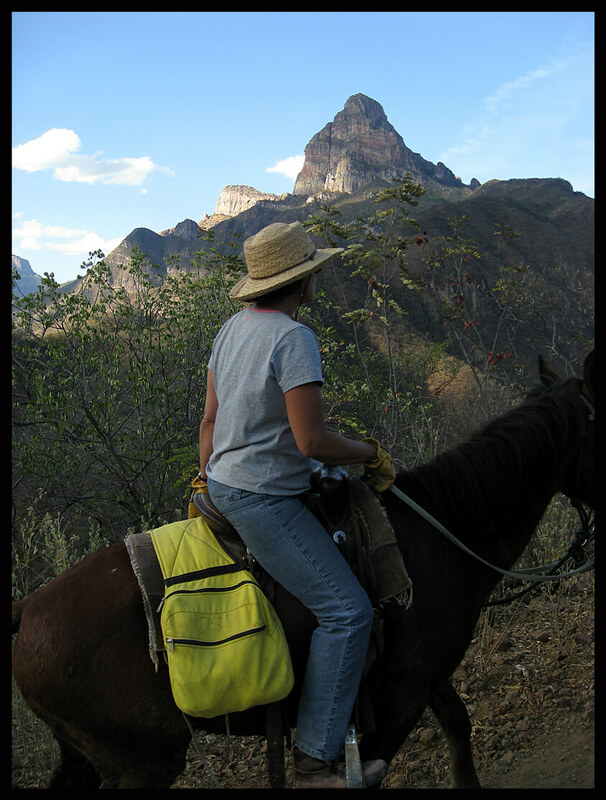 One of our horses and a great sense of adventure are all you need. Welcome to the Barranca del Cobre (Copper Canyon) of Mexico. Prospero, the Caretaker of the Los Alisos Campground, Prepares for our Stay. Time hasn’t happened quite as fast in this wonderful part of Mexico as it has in the rest of the world. People still live in open-air houses with dirt floors; they still travel on the same trails as their ancestors. 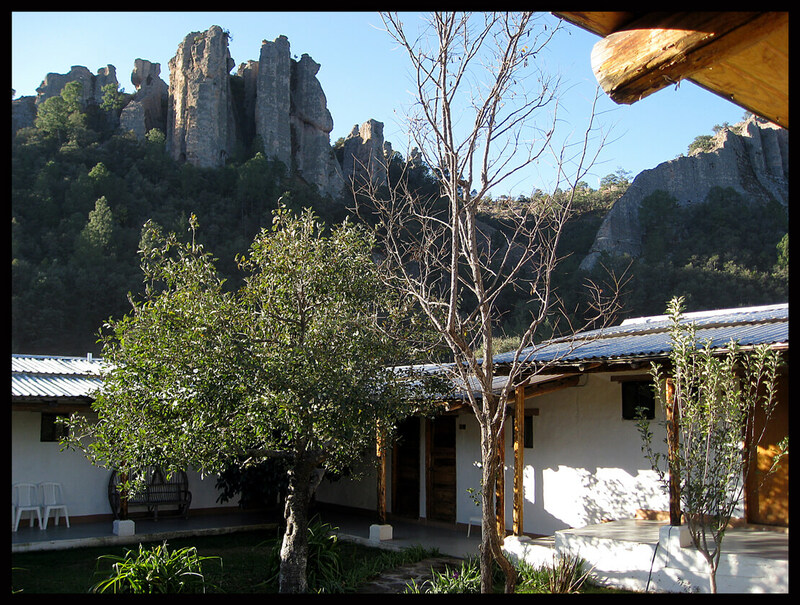 Their social structure is still intact and you might run into one of the local natives, the Tarahumara, on the trail. Perhaps you remember hearing that name a few years ago when they came to the United States and won some of the premier ultra-distance running races— in sandals! Riding on the Camino Real Along the Canal that Provided Electricity to Batopilas. All of this and more await you on this expedition back in time. 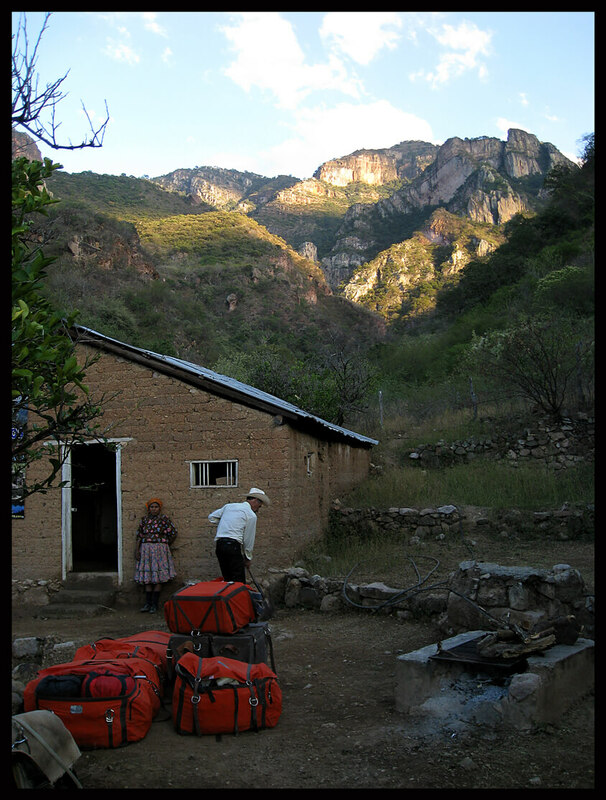 The Copper Canyon actually refers to a group of canyons in north central Mexico. These canyons are in many ways as spectacular as the Grand Canyon of the United States. 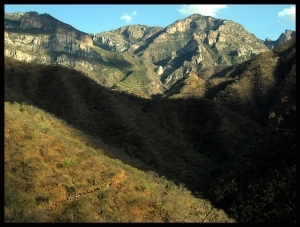 The geological landscape of the Copper Canyon is distinctly different with a dominantly volcanic history in contrast to the sedimentary record of the Grand Canyon. However, the shear size and remoteness of this maze is certainly as grand as their American sibling is. 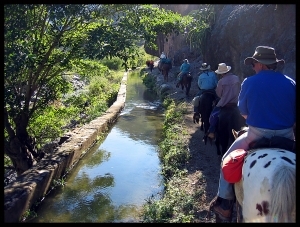 Riding in the Arroyo Leading to Los Alisos. This is remote country. It is not wilderness in the sense that we Americans are accustomed to. People live in the canyons. This trip is unique in that we completely immerse ourselves in their culture. Diego (Doug) Rhodes has a unique relationship with the people of the Canyons, developed through his traveling and leading trips throughout the region since 1990. Sometime during his extended stay in the Canyons, he decided to make it home. He and his Mexican wife Ana Marie Chavez began building the Paraiso del Oso, a tourist class mountain lodge that offers a quiet escape from the world of television, telephones and the like. Diego is there to stay. Peering into the 6000′ Deep Urique Canyon Near Trigo. Because he has so many friends in the Canyons, we are welcome to drop in, which is exactly what we do on this trip. We stay with families who love to share their lives with us. We get to sample their food, their unique lifestyle and their incredibly beautiful landscape. A truly unique experience. Ridgetop Riding with La Ventana in the Background. The trip originates in El Paso. We drive out across the Chihuahua desert then over a scenic mountain highway to the town of Cuauhtemoc where we eat dinner and stay the night. 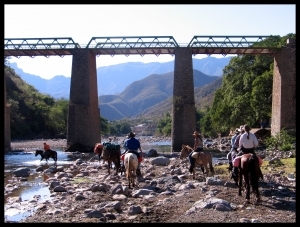 In the morning, we catch the famous Copper Canyon train, rumble up through the Sierra Madre past the tourist destinations of Creel and Divisidero, arriving at our stop, Bahuachivo, by late afternoon. Diego, or perhaps Hugo, Diego’s son and trip leader meets us in a dust covered van and escorts us to the Paraiso del Oso, where we will spend the next two nights as his guests. View from the Courtyard of the Paraiso del Oso. 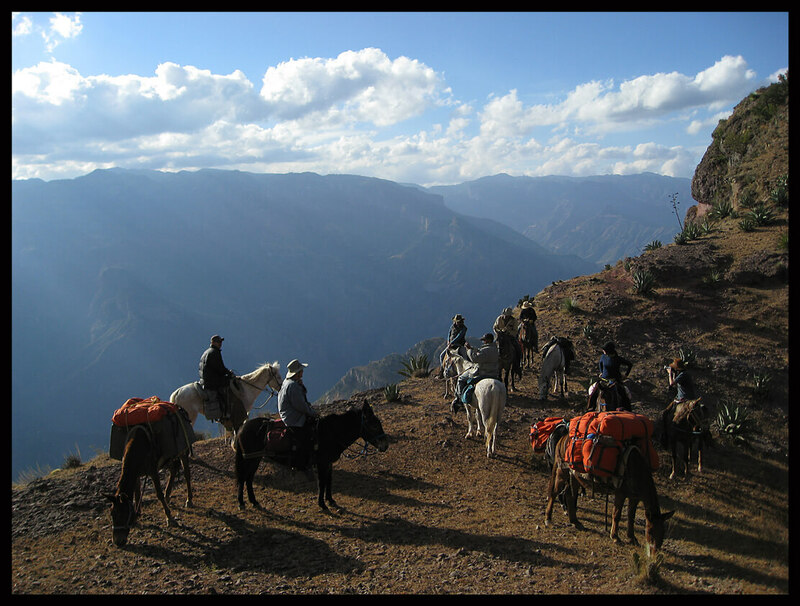 The next day, we get to choose our mounts and head out for a test ride on the steep trails nearby along the rim of the Urique Canyon- the canyon which can claim ownership of the actual name, Copper Canyon. Pack horses loaded, we trot off across the high sierra the following morning, soon skirting the rim of the great Urique Canyon which we will descend more than 5,000 feet over the next two days. 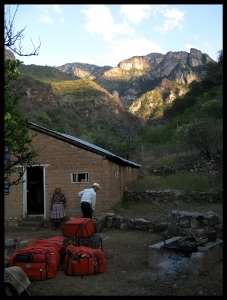 Our first camp is beside a small Mexican rancho on the edge of the Canyon at the village of Huicorachi. The owners, long time compadres of Diego, treat us to a Mexican dinner and a round of freshly made margaritas around the evening campfire. Riding Past the Plants used to Make Lechugilla. We always try to bring in school supplies to help out the communities. Maybe you will be lucky enough to deliver supplies to the local school or even luckier to pack a wheelchair down the cliffhanging trails to a Tarahumara man who recently had a stroke! Over the next four days, we ride through some of the wildest terrain on earth, finally arriving at the colorful colonial mining town of Batopilas. Founded in the late 1600s, the town has not changed much since American mining magnate, Alexander Shepard made it a hub of activity in the 1880s. The next day is set aside for rest and the opportunity to explore the town’s historical sites. We dine at the finest restaurants while lodging at the best guesthouse in town. 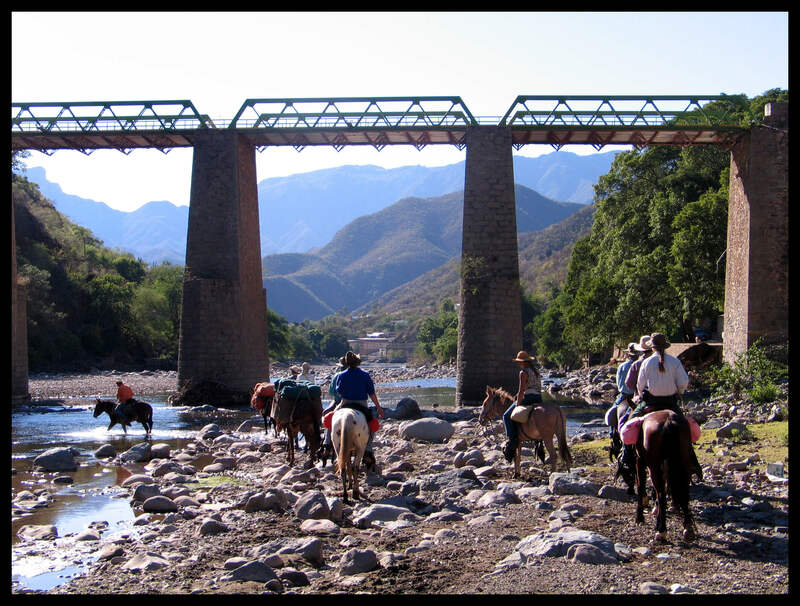 Riding Beneath the Bridge Across the Batopilas River. 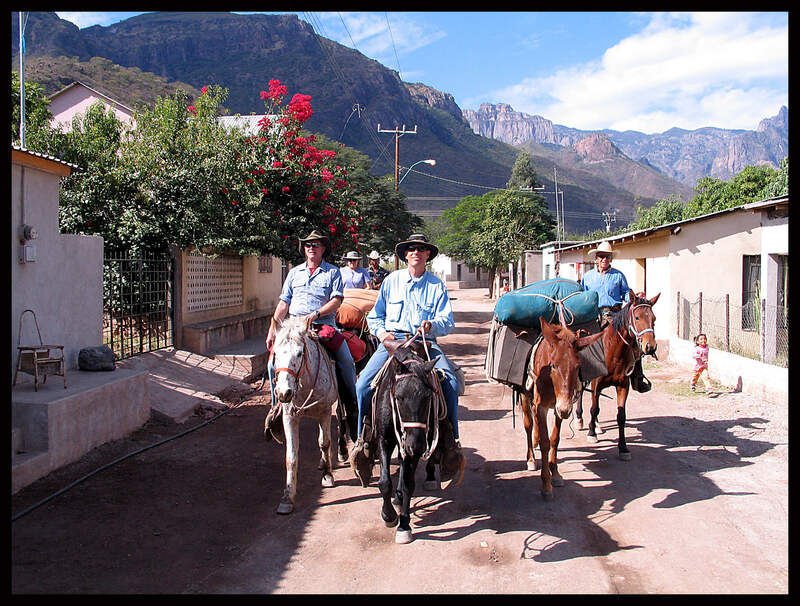 Following breakfast at the famous Dona Mica’s, we jump in the van for the spectacular drive up and out of the Batopilas Canyon to Creel, where we can take in the famous destination town and eat lunch. We continue to Cuauhtemoc where we spend our last night in Mexico before we head back to El Paso the following day. This is a rugged, physically demanding adventure. Although the horses are ‘no-nonsense’ and well trained, you must be an experienced, confident rider and in good physical condition. We spend long hours in the saddle and must hike some steep or dangerous sections. Be prepared to cheerfully accept the unplanned and unexpected. This is the real thing…. 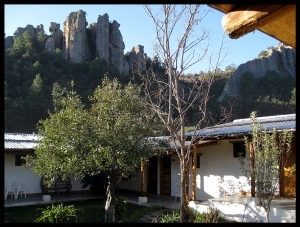 Rancho del Oso is located deep in the Sierra Madres within the State of Chihuahua. 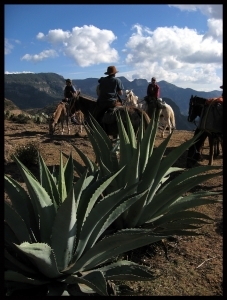 · Trips based from Rancho del Oso. 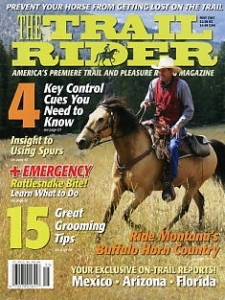 Read an article on our Mexico’s Copper Canyon Expedition Back in Time in the May 2007 issue of Trail Rider Magazine. What are you waiting for? Adventure awaits, Book a Trip with OTHO! Over the Hill Outfitters is an equal opportunity provider/employer operating under a special use permit on the San Juan National Forest. Over the Hill Outfitters is licensed (#1832), bonded and insured.